There are divergent things happening in the product and interaction design community. On one hand, we have some amazing pieces of writing from the likes of Ryan Singer and Julie Zhuo, moving our craft forward. On the other hand, we have a growing number of people posting and discussing their work on Dribbble, the aggregated results of which are moving our craft backwards. This post is not about Dribbble itself, it’s about what the community on Dribbble value. I’ll use the term ‘product design’ throughout, but I’m including UX and interaction design when I do. In the last year I’ve reviewed a lot of product design work from job applicants, at Facebook and now at Intercom, and I’ve noticed a worrying pattern. Too many designers are designing to impress their peers rather than address real business problems. This has long been a problem in creative advertising (where creative work is often more aligned with winning awards than with primary client business objectives) and its becoming more prominent in product and interaction design. Much of the product design work from job applicants I’ve seen recently has been superficial, created with one eye towards Dribbble. Things that look great but don’t work well. Perfect pixel executions of flat design, but work that doesn’t address real business goals, solve real problems people have every day, or take a full business ecosystem into consideration. Dribbble itself shapes the conversation to some extent, the medium shaping the message, with highlighting of colour palettes and other superficial details prominent in the UI. People look and people emulate. A huge majority of the product design work on Dribbble looks the same. Whether it’s social software, accounting software, a marketing site, a weather app, the same styles are applied. Blur your eyes and try and tell the difference. In contrast, the best job applicants I’ve seen sent in their thought process. Sketches. Diagrams. Pros and cons. Real problems. Tradeoffs and solutions. 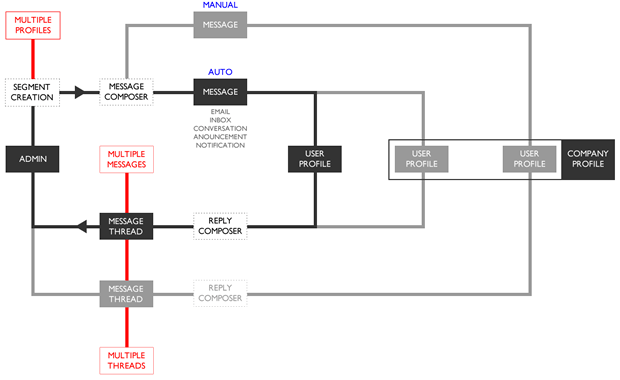 Prototypes that illustrate interaction and animation. Things that move, change and animate. Things that use real data. If product design is about solving problems for people within the constraints of a specific business, then it simply feels that many people calling themselves product/UX designers are actually practicing digital art. They are Artists. They are Stylists. Executing beautiful looking things, certainly an important skill, but not practising product design. 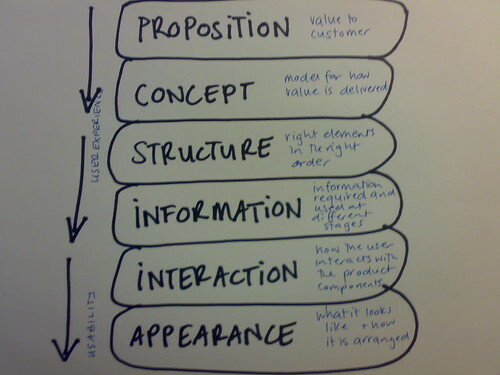 Design starts at the top of a company with the company mission. Then the company vision. It’s very hard to do great design in an organisation without a clear and actionable mission and vision. Don’t underestimate the importance of this. If your company lacks a clear mission, make it your job to facilitate the creation of one. After the mission and vision is the product architecture. Not the technical architecture, rather the components of your product and how they relate to one another. The system. On the first morning of the first day of work at Facebook, Chris Cox (VP of Product) gives an incredible introductory talk (you can get a small flavour of it here). With an audience of people from any job function at the company, whilst he could talk about anything, he focuses on explaining the product architecture, and how it relates to the company mission. I can’t ever remember seeing a product architecture described on Dribbble. It’s still too rare to witness a designer talk about how their work maps to a mission, drives a vision forward, or how it is placed within product architecture, with the weight that these things deserve. This should be the norm, not the exception. The rough ugly sketches and scribbles that describe these things are far more important than the png that ends up on Dribbble. In the process from inception to shipped functioning product, photoshop files and PNGs are the least interesting and important aspect to me. Much more important is the discussions where trade offs were made. Where pros and cons were discussed. Where people mapped ideas to the company vision, or evolved things based on the product architecture. All the whiteboard sketches, hand drawings, and back of the napkin problem solving is what designers should be posting on Dribbble. Show me those things. Even a written description of what is being built is more important than the PNG or PDF. I see designer after designer focus on the fourth layer without really considering the others. Working from the bottom up rather than the top down. The grid, font, colour, and aesthetic style are irrelevant if the other three layers haven’t been resolved first. Many designers say they do this, but don’t walk the walk, because sometimes it’s just more fun to draw nice pictures and bury oneself in pixels than deal with complicated business decisions and people with different opinions. That’s fine, stay in the fourth layer, but that’s art not design. You’re a digital artist, not a designer. The invention of the web will lead to the biggest changes to society since the Industrial Revolution. The web is permeating everything. It’s in our homes, in our workplaces, by our bed when we’re asleep, and in our pockets everywhere we go. The web is with us all the time. It’s already moving into our cars, into our clothes, into the things we own, into monitoring our health. By 2020, if not before, all businesses will be web businesses. As Charles Eames once said, “Eventually everything connects“. Designing static, linked web pages is a dying profession. The incredible rise of mobile technologies, APIs, SDKs, and open partnerships between platforms and products paints a crystal clear picture of a future where we will all design systems. 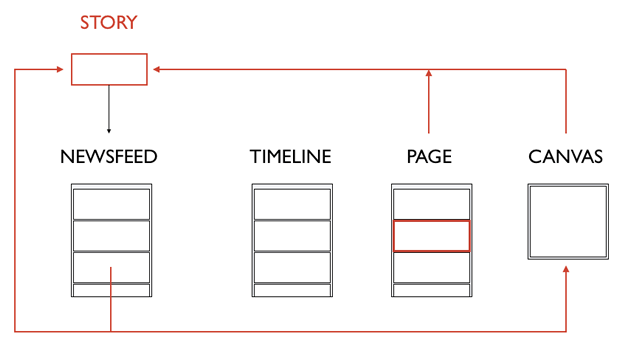 PDFs full of wireframes are a dying deliverable, Photoshop is a dying product design tool. Designers moving our craft forward are moving between sketches, whiteboards and prototyping tools (Quartz Composer, After Effects, Keynote, CSS/HTML). This is one reason people say designers should code. Whether you agree with that or not, designers certainly need to define the problem and solution not in pixels, but in terms of describing what happens between components in a system. Then build prototypes, start coding, and fine tune the details as real data inevitably shows things that were overlooked and couldn’t have been predicted. Working interactions with real data give you a better sense of how something feels. As well as using Jobs, we’re building a pattern library to reflect the system oriented nature of our design work. We’ll design more and more by using the library code rather than Photoshop. It’s not a perfect process. We iterate it constantly. I’d love to hear how all this resonates with how you work. Please comment below! In response to many comments here, on Twitter etc. I wrote a follow up post How to hire designers. Check it out! Some people on Twitter and HN have suggested that I’m conflating visual design with UX design. I disagree. 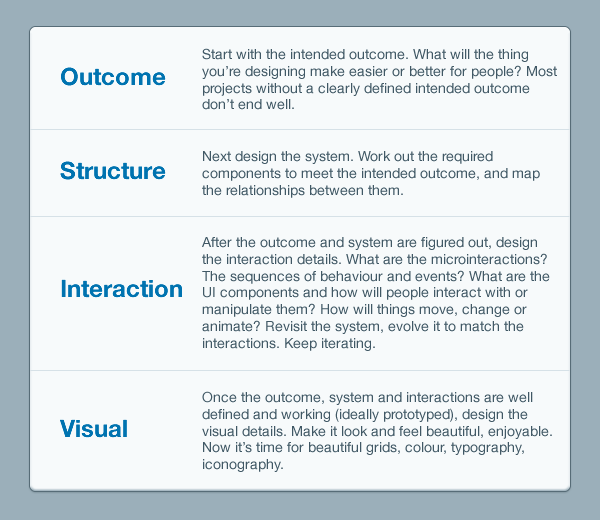 In my opinion you cannot consider visual design of an interactive product without considering the interaction and system design. This is not graphic design. We’re not designing posters, or even road signs. You can thank Des for the wonderful title of this post. Like what you read here? Why not come and work with us? We’re hiring for roles in Dublin and San Francisco. 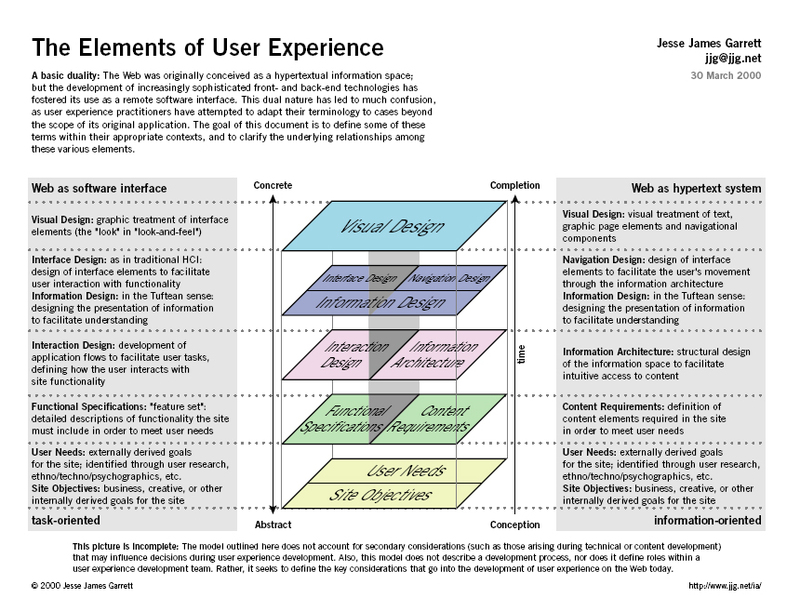 The four layers above are an adaptation of a six layer model we used at UX Consultancy Flow 7 or 8 years ago, which itself was an adaptation of Jesse James Garrett’s seminal diagram. Dribbble is a pretty good product, this is not about them per se. They could probably do a lot more to focus the community they are building away from superficial aesthetic work to more substantial problem solving work (unless they want Dribbble to be a place for digital art which might be the case).